More than a hundred million years ago a small group of parrots split off of the order of the “true parrots”. This family is a unique one, retaining more primitive features lost in most other parrots, and is known as Strigopidae. It encompasses the kakapo (Strigops habroptila), the kea (Nestor notabilis) and the kaka. Of the latter three species are known; New Zealand kaka (N. meridionalis, Gmelin, 1788), the extinct Norfolk kaka (N. productus), and the extinct Chatham kaka (N. chathamensis). 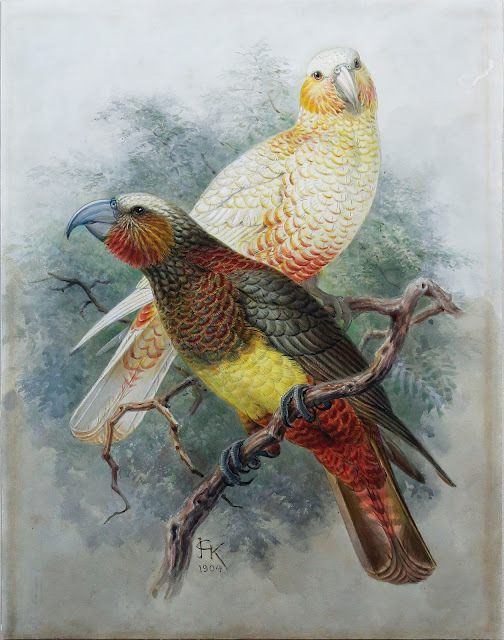 In Māori language, the name kākā means "parrot", possibly related to kā, 'to screech'. This watercolor by Keulemans is an illustration of two New Zealand kaka, both are color mutations and not a separate species, as we shall see. We are very pleased to offer this magnificent work of art as part of our collection of Natural History watercolors. The New Zealand kaka is a medium-sized parrot, and its grayish-white crown, olive-brown wings, crimson red underpart and neck red-orange underwing are an indication of its primitive features, as opposed to the brightly colored parrots that are most well-known to us. They are social birds, and often flock together squawking together in the early morning and late evening. Two subspecies are known, the North Island kaka can be found on offshore islands, such as Little and Great Barrier islands and Kapiti Island, and the South Island subspecies lives on Stewart Island, Ulva Island, Codfish Island and on the mainland; Nelson and down the West Coast to Fiordland. The kaka does not have a bad reputation as its close, alpine relative the kea, which is notorious for attacking sheep and eating fat of the back of the animal, while the sheep are still alive. Instead, the kaka consumes fruits, seeds, flowers, buds, honeydew, sap, plants and invertebrates. The parrot is considered vulnerable, for the same reason as with most parrot species; previously hunted, loss of their natural habitat (they live in lowland and mid-altitude native forest) and introduces species like possums, deer, pigs and wasps that compete for food. But the biggest threat is the introduction of mammalian predators, particularly the stoat, but also the brushtail possum. Just like the kakapo the reproduction is slow, once every two to four years, depending on the blossoming of the Nothofagus. Females breed for 90 days in a hollow tree, making them an easy target for stoats. Probably fewer than 10,000 of New Zealand kaka exist today. Looking at Keulemans’ watercolor, the first and most striking feature is the mayor difference in plumage color of the two birds. It is not surprising that John Gould described these uniquely colored birds as separate species, as being Nestor esslingi in his to his superb folio work on The Birds of Australia (Ill. 2). 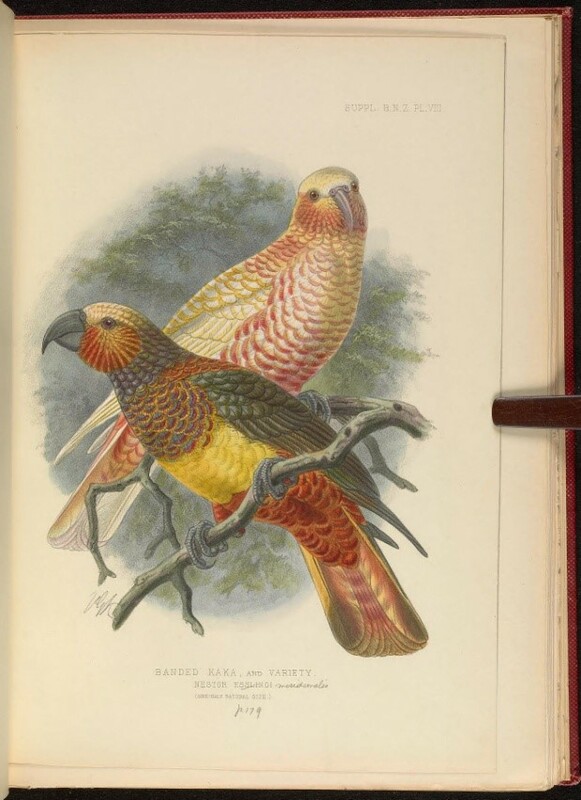 In Buller’s second edition, a wild-type and orange-red variety is illustrated, the latter is known by natives as kaka-kura (ill. 3). Buller goes to great length in specifying the half dozen mutations he has seen, varying from red to orange, yellow and white. Back in the day kaka with exceptional plumage were scarce, and due to the high price that could be fetched with these birds, they are nowadays nowhere to be found. In his third edition, for which Keulemans in 1904 made this superb watercolor, Buller chooses to once again illustrate a kaka variety, this time with a yellow belly and a very light colored one, a lutino. Buller treats it correctly as a mutation of the highly variable Nestor meridionalis, even though he describes these birds in a separate chapter, as Nestor esslingi, the ‘yellow-belted kaka’ (ill. 4). Both specimens are part of his son's collection, and the lutino is “so lovely an object that I have given a figure of the bird on the same plate as its near congener, Nestor esslingi (…) which my son was fortunate enough to obtain from Mr. Henry Travers.” This might seem strange, since the illustration of 1888 is also a very appealing and seemingly correct image of the parrot species. In the third edition the illustration of the wild-type is even missing. It seems that by depicting another, but different varieties of which the front one is almost entirely similar to Gould’s Nestor esslingi, Buller once again emphasizes that these kaka are in fact mutations within the same species. Keulemans’ work of art of these exceptional kaka is phenomenally done. Like the kea, Keulemans knows how to position the birds in order to gain an interaction with the viewer. The parrots look well balanced, especially the front one, and so enhances their liveliness. Looking at the feathers, these mutations have a complex color scheme in which most of the feathers carry multiple colors. This is clearly visible in the breast and belly plumage. Instead of depicting the feathers as a solid set of separate scales, as it is with fish, the artist convincingly paints the feathers as a soft material, while adding depth to the composition. Of all colors in birds, white is one of the hardest to reproduce because of the balance between showing the individual feathers without compromising on the subtlety of the white plumage. As can be seen in the lutino, Keulemans did here a beautiful job as well. One of the most challenging artistic choices is the posture of the second bird’s head; not one, but both eyes stare at you. Parrots are prey, so their eyes are located more sideways than with birds of prey. They are able to look straight ahead, for instance to measure depth right before takeoff, but would rather observe sideways, as can be seen with the darker colored kaka. By depicting the lutino kaka from the front its bill has to be optically foreshortened, and the eyes have to be positioned perfectly correctly, which is a tricky task. Slightly off centre will be noticed immediately. But here as well, Keulemans shows his masterful skills in his illustration of birds. Johannes Gerardus Keulemans, Banded Kaka and Variety, watercolor, 1904. 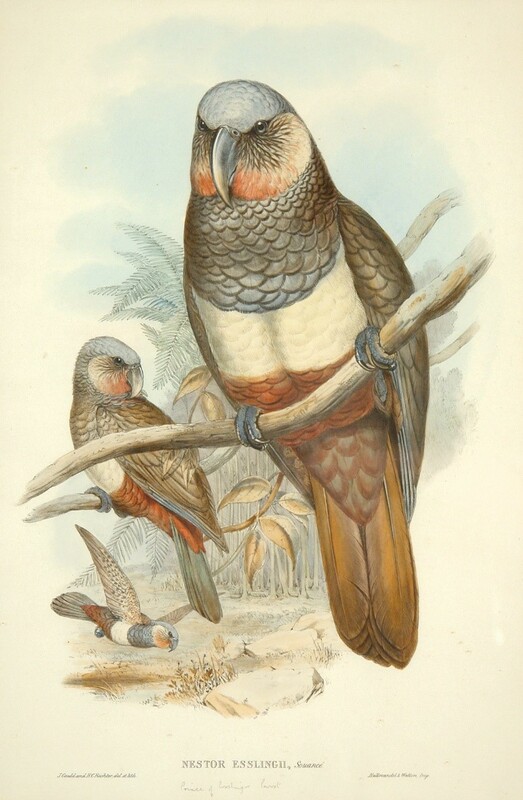 Henry C. Richter, Nestor Eslingii, Souancé, for John Gould, Birds of Australia, Taylor & Francis, London (1869), lithography. 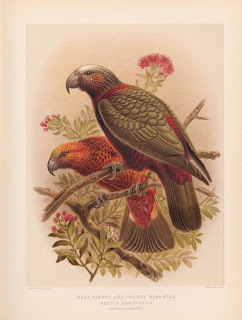 Johannes Gerardus Keulemans, Kaka Parrot and Variety “Kaka-Kura” for Walter Lawry Buller, A history of the birds of New Zealand, London (1888), vol 1, Lithography. Johannes Gerardus Keulemans, Kaka Parrot and Variety for Walter Lawry Buller, Supplement to the ‘The birds of New Zealand’ London (1905), vol 2, pl. VIII, lithography. In the corresponding plate it is referred as Banded Kaka and Variety. Walter Lawry Buller, Supplement to the ‘Birds of New Zealand’, London (1905), vol 2, p. 77-80.